Make a run. 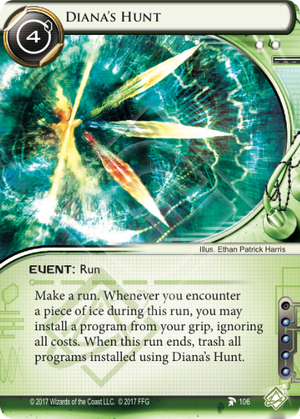 Whenever you encounter a piece of ice during this run, you may install a program from your grip, ignoring all costs. When this run ends, trash all programs installed using Diana's Hunt. If the Runner uses Diana's Hunt to install a Femme Fatale targeting the encountered ice, can they then use Femme Fatale to bypass that ice? No. The Femme Fatale was not installed at the time that its trigger condition would have been met. I gave this card a passing glance and thought it was interesting, perhaps only vaguely powerful, with strangely high costs and a large downside. Then, something dawned on me: you can use Sacrificial Constructs to save the things you want. Not only can you cheat out Femme Fatale, Morning Star, or Inversificator, you can keep one for each construct. Even Mass-Driver and Ankusa begin to look usable. If it costs 3 or more, go for it! You can also do things like deploy that AI you've been wary of installing after you pass that mean IP Block. It doesn't have to be an icebreaker either, place down Magnum Opus if you've already got a few breakers down and would be running anyway! For usage past SacCon, it's even better when you're mostly set up. On deeper servers, you can afford to start tossing whatever disposables you've got in hand to make your short-term click and cost efficiency skyrocket. Pull out a Cache and refund most of the cost, counter spooky things like Excalibur with Egret, drop an Equivocation if you've got another in your hand anyway, Surf a barrier past something dangerous, blast D4v1d or Cerberus "Lady" H1 counters without a care. As Goldstep has mentioned it also fits perfectly with trash-effect programs. Pull out a SMC mid-run if you don't have answers in your hand! Or pull out your favorite conspiracy breakers since they want that trashbin anyway. In conclusion, this card opens up a lot of possibilities and allows you to respond to each ICE after the corp rezzes it. SacCon makes it even better since you can save your toys. An excellent tool for shaper and well-worth the costs for others, especially if you're using Sunny or Adam for their huge influence pools. Abagnale, Crowbar, Crypsis, Demara, Grappling Hook, Harbinger (if you are using it for Endless Hunger anyway? ), LLDS Energy Regulator (we're a little desperate here, I know...), Lustig, (with some combo pieces) Parasite, SMC, Shiv, and Spike. Allow for Spin Cycle and Genesis and we add Sharpshooter, False Echo, Faerie, Disrupter, Deus X, Crescentus, and Copycat. There are others like the bird breakers (Golden, Peregrine, and Saker) or the Devas (Vamadeva, Sadyojata, and Aghora that could go to the grip after or Brahman that could add to the stack, but the question becomes, is this enough to make this work? SMC is free so you are only saving a click and meanwhile you have to have SMC in hand. Either Diana's Hunt or the Birds/B&Es/Swindlers will cost you out the nose in influence. In the end, the issue becomes making a deck around a card that is clunky and expensive. Make this a 1 credit 1 influence, I'll make a crazy free-bird deck just for fun. Make this a stupid broken "pull the program from your grip, heap, stack... trash if the run isn't successful" instead of only grip and no matter what, and I'd bet it would get Most Wanted Listed the next day. But as printed it's so corner case, that I doubt I'll ever put the effort in the sleeving a deck for it, just because I doubt it will ever actually work as desired. Interesting utility. I can see some possible uses with professor or exile not that either of those are terribly competitive ID's. Not a great way to build a rig. If the thing wasn't 4 influence it would be a nice splash into something like Ken or Steve Cambridge. If this card had the word "used" instead of installed, it would be an excellent way to cheaply install expensive programs during a run on a server with a ETR, only to not use them during that run so they don't get trashed and bounce of the ice with a new toy installed. I am not even convinced it would be that amazing with this word change. 4 credits, a card and a click is a lot to ask for, so you would have to install a pretty huge breaker such as Femme Fatale to get any real value out of this. Even installing something like Inversificator would technically just make you break even, except if you decide to run on a server you were gonna run on anyway (click compression <3 ). Buuuuuuuuut it doesn't say used, it says installed. And not only that, it says trashed. So no shenanigans of installing Femme, targeting ice, getting past said ice for cheap and then bouncing it back to the hand. Bird Breakers get around this restriction by bouncing themselves back, but are you really building a shaper deck with those? Or pay a whopping 4 influence to play this card in Criminal? Maybe if it was a lot cheaper this card could see play the way it is worded, but it is 4 CREDITS. And for that price, I would not bother.